If you’ve been to any of our Mastery Series workshops, you know we consider managing light to be the photographer’s first and most important consideration for getting a quality image. It’s not just a matter of getting a “correct” exposure; it’s also a matter of using the light to direct attention to what’s important in the composition and to help create the impression of depth—that all-important 3rd dimension—in a flat, 2-dimensional medium. Still, the most skilled composition won’t mean a thing if the image is severely under- or over-exposed, and while the built-in exposure meter in a modern camera is amazingly sophisticated, there are routine, every-day circumstances that simply overwhelm the camera’s metering technology. In images with an extended dynamic range (think, e.g., a landscape bisected by a horizon with bright blue skies above and a dark forest below), your camera will likely return an unsatisfactory reading and exposure setting. 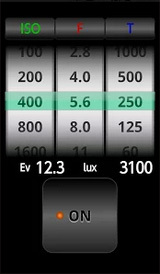 The reason is that your camera’s meter measures the light that is reflected from your subject. That won’t tell much about the amount of light falling on your subject, however, since a bright, highly reflective subject will send more light back to the camera than a dark subject will. If you took one of our workshops, you know that your camera’s meter is programmed to set its exposure for a value that’s known as middle—or 18%—grey, or, in other words, a medium level of brightness. Unfortunately, when a reflected-light meter encounters something that actually is white, like, say, a bride’s dress, its interpretation is that it’s seeing a grey dress that’s severely over-exposed, so its response is to stomp on the exposure until it’s dark enough to make the white dress look like the camera’s preferred brightness value of middle grey. Similarly, if it’s looking at the groom’s black tuxedo, instead of recognizing black, the camera’s meter assumes it’s seeing a grey suit that’s severely under-exposed and cranks up the exposure until the black suit washes out to grey. The camera is now happy; your bride probably won’t be when she sees the photos. 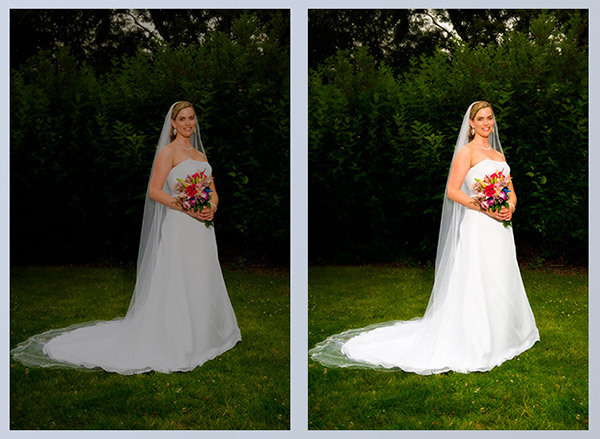 The image on the right is correctly exposed, revealing details in the bride’s white dress. The image on the left is what the camera’s meter prefers, since the brightness level of the dress is now closer to 18% grey. In contrast, a dedicated light meter is usually programmed to read “incident” light, that is, the amount of light that is falling on the scene, not reflected from it. Obviously if we’re measuring the source of the light directly rather than its reflected value, our exposure can be set more reliably because it isn’t based on the relative brightness of our subject. Whether the bride’s dress is white, grey, or black, the amount of light falling on it is constant, and that’s what we want to measure (and set our camera’s exposure to). Good light meters are precise, reliable, and consistent. Unfortunately, they also tend to be expensive. 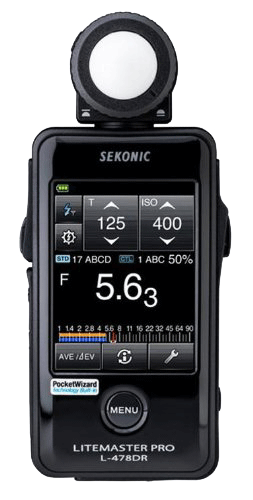 The Sekonic L-358 at left that we’ve used for years is a mid-range unit that currently costs around $400. Its new, digital replacement, the L-478DR goes for about $420, and you can spend more on other meters with extra features. Make no mistake here: these photographic tools are as fundamental to professional photography as a hammer is to a carpenter, and they’re worth every penny if you’re getting paid to take properly exposed photographs. I’ve been at this for 30 years, and I still wouldn’t take a studio shot without a meter reading. If I have time outdoors, the meter comes out of the gear bag and goes to work, giving me correctly exposed images on which I can reliably stake my business’s reputation. While cruising through one of the photography forums I participate in, I recently became aware of something I probably should have known about a long time ago—there’s a smart-phone app for that. In fact, there are lots of them. No, they’re not a dedicated, hardware-based light meter, but the best ones are surprisingly functional, and come with extremely useful features enabled by their mini-computer capabilities. They’re also generally free, or at most, a few dollars, as is the usual case with phone apps. Unfortunately, with a few notable exceptions, they’re also all reflected-light meters, not incident meters. So why would anybody use one of these apps instead of the camera’s meter? Frankly, you probably wouldn’t. Up to now their primary use has been as a meter for older film cameras that don’t have built-in meters. If you’re still shooting film, one of these apps can be very helpful, and you’re probably already carrying its phone host anyway. And, did I mention, they’re free(ish)? At the very least, if you’re still having problems visualizing the innerworkings of the “Triangle of Exposure” (aperture, shutter speed, and ISO), playing with the “dials” on any of these apps will give you a graphic interactive tutorial. Switch any of the three inputs, and see what the app does automatically with the others. Full disclosure here: although I use a Mac in the studio, my phone is Android-based, and although I’ve used all of the Android apps mentioned below, my experience with iPhone-based apps is by hearsay only. If you’re using an iPhone and want to try the two listed below, check back in and let us know how it goes. You have to sympathize with the plight of Android phone app developers. Unlike the iPhone universe, there are numerous hardware platforms running the Android operating system, so the performance of any particular app can vary considerably depending on which phone it’s operating on. My current phone is a Samsung Galaxy Blaze, and even within the Samsung Galaxy phone universe, app performance can vary — buyer beware (fortunately, all of these apps are free). With that caveat in mind, there are three Android apps that I like and can cautiously recommend. 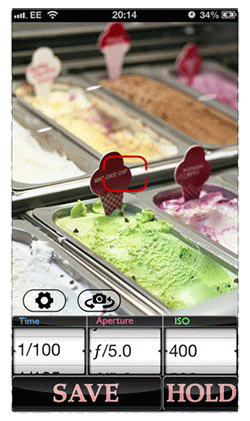 The BeeCam app uses the brightness reading from your phone’s camera sensor to perform like a true incident light meter. 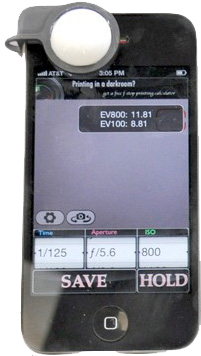 As you can see in the image to the left, you can set ISO, F-stop, or shutter speed (T, for time) by tapping one of the “buttons” and selecting or entering a value. 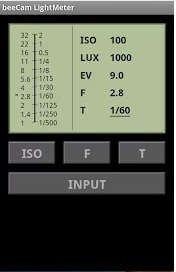 Select two of those “Triangle of Exposure” values, aim the camera at the light source, and the BeeCam will calculate the third. Simple, straight-forward, and seems to consistently return accurate readings. Like all of these apps, it won’t help you calibrate flash exposures, but if you’re trying to figure out accurate settings for ambient light, particularly in high-contrast situations that might fool your camera’s reflected-light meter, the BeeCam can be a big help. Click here for the Android Play Store link. Note that there is also a paid ($1.50) version without ads, but the free version is so functional and relatively free of advertising clutter that I haven’t felt the need to upgrade. There’s nothing in this app’s description that indicates it might be an incident light meter, and after initially getting wildly inaccurate readings because I’d assumed it was a reflected light device, I finally realized I’d just been aiming it in the wrong direction. When I pointed it at the light source, it suddenly started working. So, yes, it is apparently an incident-meter app, and a pretty accurate one at that. Instead of pushing virtual buttons, you “roll” the ISO, F, and T “wheels” up and down to make a selection. Set two, and the app calculates the third. Hey, if nothing else, it’s fun to watch the wheels spin as the app does its business. Like most, it has both a free and a paid ($1.50) version, which removes ads. Click here for the Play Store link. 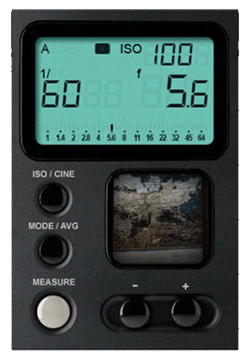 This one is clearly a reflected-light meter that simply reads data from a picture you’ve already taken and reports the exposure values — not very useful and much less convenient than just using your camera’s built-in meter. It also has the ugliest and most cluttered interface of any of these apps. So why recommend it? Because it also comes bundled with a treasure chest of other helpful tools. Want to know when the sun will rise or set in Glacier National Park — or anywhere else — on any particular date in the future? Just select the date, enter the GPS coordinates (or type in an address), and the app will tell you, both actual sunrise and -set, as well as twilight times for those beautiful, red-horizon landscapes. There’s a moon-phase calendar and an exposure calculator to help you set correct exposures for photographing la lune, and the app will even track down a weather forecast for the location. 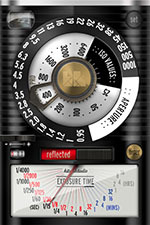 There are calculators for finding the minimal hand-held shutter speed for a particular lens for a particular camera and for estimating depth-of-field, hyperfocal distance, and field-of-view for any particular lens at any particular f-stop. You can calculate flash exposures based on guide number, aperture, and distance; or how much you need to under-expose each snap if you’re making multiple-exposure images. The app even includes a time-lapse calculator, a timer, and a stopwatch. Frankly, I’ve never seen such an extensive collection of photo tools in one place, and I find myself using this app, especially for exterior locations quite often. Here’s the link. Unfortunately, if you have an iPhone, the choices are less functional, since all of them at the moment appear to be reflected-light meters. (There is one app called, well… “Incident Light Meter,” which, well… isn’t; when someone develops an app to execute a function he clearly doesn’t understand, I’d have to question the app’s utility.) There do appear to be two apps that work, more or less, reliably as reflected light meters, and there is a development afoot with some exciting potential for converting any of these iPhone apps into an actual incident-light meter. This is the app I mentioned above that was being used by a member of a professional photographers’ forum, primarily in his landscape work with medium-format film. It appears to be both well regarded and well supported by its developer. I’m not aware of any additional features beyond the metering capability, but it does seem to perform that job reliably. Here’s the developer’s link: http://ilightmeter.leosh.com/ . You can follow his featured link to find the app on the iTunes App Store. Interestingly, this app also claims to work on the iPod Touch 4G, so if you’re carrying your tunes but not your phone, this might be the one for you. Again, no additional features, but it’s well-reviewed by users, and appears to be functional and stable. Here’s that potential new accessory mentioned above that could turn your iPhone into an actual incident-light meter. It’s a translucent globe, similar to what you see on the dedicated Sekonic light meters shown above. Although it’s not available at the moment, it has reached its Kickstarter crowd-sourced funding goal and appears to have entered the final manufacturing stage. 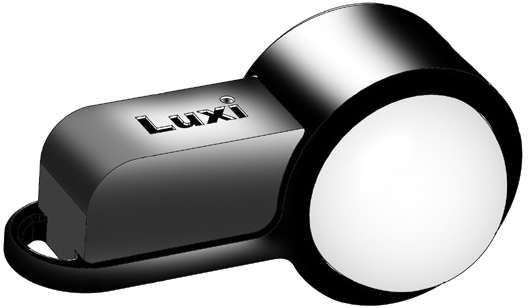 Here’s a link to the announcement: http://www.gizmag.com/luxi-incident-light-meter/26374/, and here’s a link to their Kickstarter investor page: http://www.kickstarter.com/projects/jamesflynn/luxi-incident-light-meter-adapter-for-iphone (be sure to watch the video; it’s a good explanation of what an incident light meter does). This certainly could be an interesting product to keep an eye on, especially given that its projected price is under $25. You’ll note in the gizmag link above that its first projected customization will likely be for the Pocket Light Meter app. Alas, since this is a dedicated hardware accessory, there appears to be no projected coordination with Android-based phones, undoubtedly because their numerous physical form factors are too diverse to profitably design for. This entry was posted in Picturing the Shot, Sourcelight Buzz.